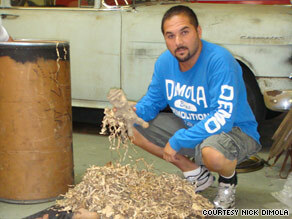 DiMola says he wants to donate artifacts to museums across U.S.
(CNN) -- One man's trash is another man's mystery. Nick DiMola holds what he believes are about 60 artifacts and pieces of artifacts from Mexico. Five years ago, Nick DiMola's rubbish removal company was hired to clean out a Manhattan apartment following the death of the owner, abstract artist Clinton Hill. The contents of a barrel that DiMola salvaged from the trash then has today raised a series of questions. What DiMola holds are about 60 artifacts and pieces of artifacts that he thinks are from Mexico, dating to between 300 B.C. and 500 A.D. The mystery, which the Mexican Consulate in New York is trying to solve, is twofold: How much are the artifacts worth? And, if authentic, whom do they belong to? DiMola first saw the collection of pottery and figurines while cleaning Hill's apartment in 2004. He stored the barrel in his warehouse instead of disposing of it, then promptly forgot about it. Last week, DiMola rediscovered the pieces, only this time he told the New York Daily News about what he had found, announcing that he would sell them. That caught the attention of the Mexican government, which is studying the origins of the items and has claimed them. Now, DiMola wants to donate his find, but not necessarily to Mexico, he told CNN. The Queens native was excited about his discovery when he allowed representatives from the Mexican Cultural Institute to examine and photograph nearly all the pieces, DiMola said. His curiosity about them was growing, and he was expecting an appraisal from the government officials. What he got instead was a heads-up about a possible petition to return the entire collection to Mexico. "My reaction is that that is not very diplomatic," DiMola said. "It's a blow to the jaw." Ruben Beltran, Mexico's consul general in New York, was not available for comment Tuesday. However in an interview with the U.S.-based Spanish-language TV network Telemundo, he said that if the pieces are part of Mexican culture, the government will try to get them back. But as of now, no one is certain what the pieces are. Howard Nowes, an ancient art dealer who does appraisals, examined a handful of the pieces that DiMola holds. Nowes told CNN he saw a mix of authentic and non-authentic pre-Columbian pieces, which he valued at $3,000. The pieces were broken and weren't very artistic, he said, adding "from what I can see, it was mostly junk." Unfazed, DiMola thinks all the pieces probably are worth more than $16,000 total, he said. "Something like this, you can't put a price on, because I may have a figure that no one has seen before," DiMola said. "There's a big value in these pieces." The Mexican government isn't taking any chances, and is conducting its own research into the authenticity and significance of the pieces. Museums in Houston, Texas; San Francisco, California and Washington, D.C., have expressed interest in the pieces as well, DiMola said. He said he'd like to donate the artifacts to museums across the country, and some to the Mexican Cultural Institute at the Mexican Consulate in New York City, but that could change if Mexico uses international law to claim the items. The foundation that hired DiMola to clean the house is unlikely to try to reclaim the pieces, said John Koegel, the attorney who handled Hill's estate. When Hill died, he left all his possessions to his lifelong partner, Allen Tran, Koegel told CNN. In turn, Tran bequeathed all of Hill's possessions to a foundation "to carry out his artistic legacy," he said. Hill had some pieces from Mexico in his apartment that were cataloged, but the artist had no strong connection to the country, Koegel said. For DiMola, all the fuss stems from a simple truth. "Sometimes you find things that are good and salvageable in the trash," he said.